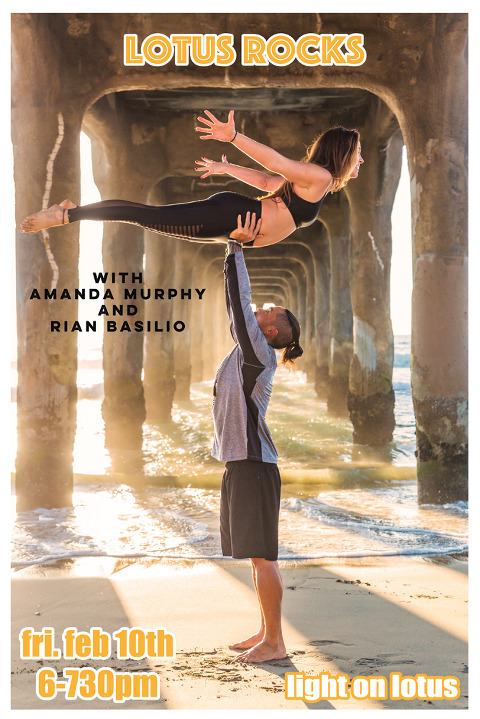 Amanda and Rian grew up on different islands on opposite sides of North America, but they found each other and a mutual love for yoga on the beach in Los Angeles. Both received their teaching certification with Yoga Mittra at The Yoga Loft in Manhattan Beach and both currently teach at several studios in the LA area. Each one of them has a unique teaching style that works to balance the yin and yang energy of their team-taught classes. They work to create classes that both balance and challenge the body and mind. With the heavy focus being put on the connection between your breathe, body and movement. Set to a LOVE themed soundtrack along with live music by Rian, Lotus Rocks is a vinyasa flow style class approachable for yogis of any level. Whether you seek enlightenment, connection or you just wanna dance, come have some fun at Light on Lotus Friday night. Get more info here.